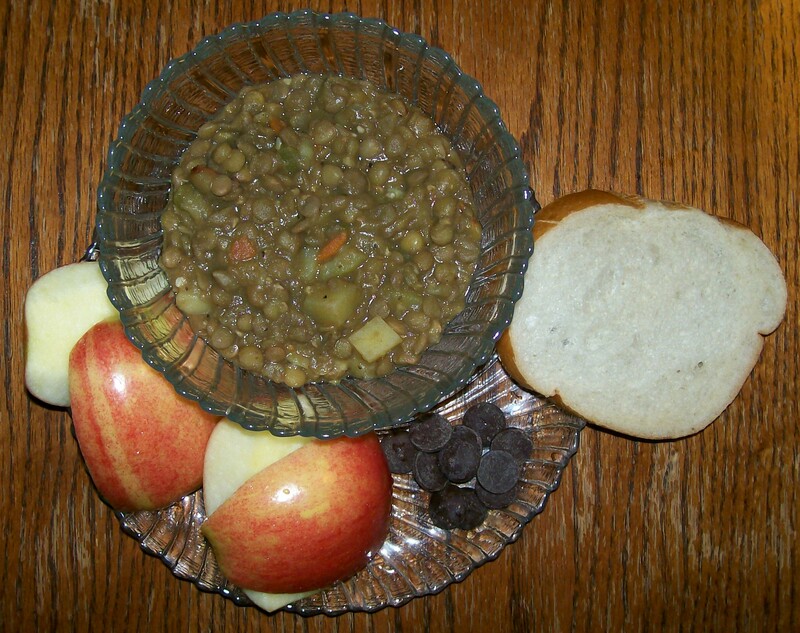 Clockwise from top: Lentil Soup, French Bread, 65% Cocoa Chocolate Chips and an Apple. I made the lentil soup that I posted a link to a while back. Once I did everything according to the directions, I tasted it….uh, yeah, no. It was seriously lacking in spices. Once I got it all doctored up, it was okay…but, I will go back to how I make it. 😦 Otherwise, dinner was pretty good. Start with the lentils and water in a large pot. Bring to a boil, cover, turn heat to low and simmer until they become crunchy-tender, about 30 to 45 minutes. You should not need to add any water during this stage, but check on it periodically to make sure. In a large skillet, heat the oil and caramelize the onions. Just before they finish, add the garlic, cumin, coriander and fennel and stir until the scent rises. Remove from heat. When the lentils are crunchy-tender, add the onions etc. mixture (including the oil) and the rest of the ingredients to the lentils. Stir well and add just enough water to barely cover everything (about 4 cups). Bring to a boil again, cover and reduce heat to simmer for 20-30 minutes, until the vegetables and lentils are tender and the broth is nice and thick.